Iron Man 3 was an impressive movie, in my opinion possibly the best of the Iron Man franchise – and that’s high praise, because Iron Man is the best of Marvel superhero franchise films going. This picture sums up the movie. 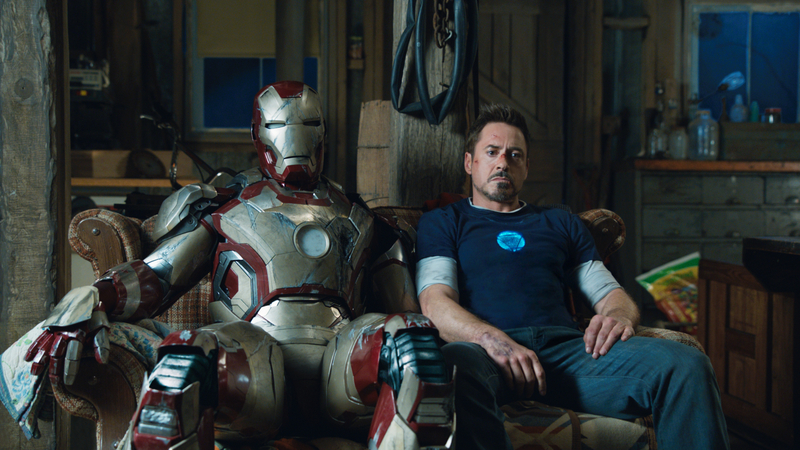 As we begin, Tony Stark is suffering from some kind of anxiety disorder stemming from the events of the Avengers movie. Aliens, gods, destruction of Manhattan – he has retreated to his home and holed up, neurotically building Iron Man suit after Iron Man suit and having panic attacks. It’s a good riff off the Tony Stark of the comics, who would have drunk himself into a coma – I guess they decided that wasn’t good for the kids or something but this works. A terrorist called The Mandarin, who looks all bristly and ringed and scary, not green and quite so Yellow Peril-y as in the comics but threatening as he releases his oddly paternal press releases upon commission of various bombings and other acts of terror. As you already know from the trailers, Stark tries to stay out of that for a while, then gives the Mandarin some stick, and gets his house blown up good with him and Pepper in it. And thus it begins! I was wondering how they were going to avoid “jumping the shark” with the introduction of the Mandarin. Sure, the overall Marvel universe has every kind of weirdness in it, but they rightly try to usually keep it down to 1 or 2 even in a given comic, and Joe Sixpack is going to bail out if the Marvel movies ladle it on too thick. I’m not going to spoil the big plot twist here, but I absolutely love and approve of what they did with the Mandarin in this movie. I will note that Ben Kingsley is unexpectedly hilarious. They kept Tony out of the armor for a lot of the time, and that worked very well. There was one armor-holocaust fight scene, and that was nice, but they made a much stronger movie by not just “amping it up” for a third movie. In fact, I’m even more impressed as I wonder how they got that to fly at all. I can imagine the discussion with the Hollywood exec. “Iron Man 3! So we’re going to have like 4 story tall Iron Man right? And bigger explosions, we upped the effects budget by 250%!” “Uh, no, we were thinking Tony would be out of the armor and dealing with psychological stuff and talking to kids and stuff.” The level of blackmail and extortion that must be required to make an actual good movie as the third in a blockbuster series is dizzying. Anyway, we get to see A.I.M. in action (no MODOK, sadly) and their creation of Extremis, a bio-nanotech superjuice that isn’t all that unrealistic really. They don’t wear the cute little yellow suits though. I’m not saying any of the main actors should get an Oscar, but for a blockbuster/superhero movie, Iron Man 3 is remarkably well written, directed, and acted. I give it 4 out of 5 M.O.D.O.K.s. This entry was posted in reviews and tagged iron man, marvel, movie, superheroes. Bookmark the permalink.